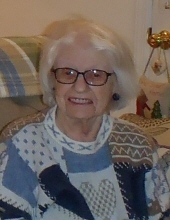 HARRINGTON, Shirley Ann - Age 86 of Fenton, passed away November 23, 2018. A committal service will be held at Great Lakes Cemetery, Holly at a later date. Funeral arrangements provided by Sharp Funeral Home and Cremation Center, 6063 Fenton Road, Flint. Shirley was born October 7, 1932 in Alanson, MI the daughter of Jay and Pauline (Paige) Shannon. Shirley enjoyed cooking, she loved her cat 'Cookie", and especially loved spending time with her family ! Surviving are : children, Gilbert (Kathleen) Harrington, Leisa Kaczmarczyk, Jeff (Mary) Harrington, and Lori (George) Stevenson; grandchildren, Jeff (Karen) Harrington Jr., and Chris Harrington. Shirley was preceded in death by her husband, Thomas Robert Harrington; sister, Evelyn Shannon-Campbell. Online tributes may be shared at www.sharpfuneralhomes.com. To send flowers or a remembrance gift to the family of Shirley Ann Harrington, please visit our Tribute Store. "Email Address" would like to share the life celebration of Shirley Ann Harrington. Click on the "link" to go to share a favorite memory or leave a condolence message for the family.